Cassiopaea relies completely on individual reader contributions. This allows us to keep our independence. Has Nibiru/Planet X Been Sighted? The confirmed linchpin for the fall of the late Bronze Age cultures, the Middle Eastern Civilizations, and other recorded disasters that are found to be "around that time," seems to be the period from 1644 BC to 1628 BC. The ice cores show the disturbances starting in 1644 (registering in 1645) and the tree rings show a big spike in 1628, though the entire period was disturbed. Similar evidence from the same source article exists at 5200 BC. This period shows a less severe but similar period. The oxygen 18 profile is close to normal, but there is a visible volcanic dirt band. The dating of this segment is less close because it is clear that nobody is really looking for this cycle, but it appears to correspond to the ash band from the Byrd station core. It is conjectured that the cycle goes unnoticed because of long term aftereffects, such as cooling climate, as well as the fact that each cycle has greater or lesser effects on the earth depending on its relative position in the solar system at the time. What is clear is that whatever comes at 3600 year intervals as shown by the ice cores, is capable of setting off prolonged periods of earth changes that are above the levels of ordinary uniformitarian geologic and climatalogical changes. But the evidence suggests that it is a shower of asteroids or coments that are NOT seen until it is TOO LATE. In an article in Nature, November 1980, Hammer, Clausen and Dansgaard date a disturbance from the Camp Century core to 5470 BC +/- 120 years. This compares to the proposed Hekla eruption which was radiocarbon dated to 5450 BC +/- 190 years. There is an appreciably high acidity signal at these sections of the core which indicates a high level of volcanic activity - again, right at the 3600 year cycle mark. When looking at the data and taking into account the acknowledged dating inaccuracies (some of the ranges of dates can go 100 years in either direction of the spike, even though the spiking is regular and rhythmic) for the more recent dates, and 3 to 600 years variance for the older dates - especially when one considers that these are broad analyses and nobody was really looking for anything specific - they just said "wow! look at that wavy line!" we find that the southern ice cores do not register the same as the northern ones. The 1628 BC event that really slammed the tree rings shows almost no registration in the Antarctic cores in terms of volcanic activity. But the northern cores show the activity beginning 1644 BC. The evidence for the 5200 BC event is strong in the Dome C core. The 8,800 BC event is well marked - in fact, seems to be the strongest of them all... The Flood of Noah, no doubt! The oxygen 18 isotope variation is noticeable, the rise in sea-salt, elevated levels of C 1 and C1/Na. There is an extreme spike in SO (sub 4) and H readings suggesting widespread volcanic activity - great earth changes were happening at that time, and they registered in the climate, the oceans, and were preserved in ice. The 12400 BC event is extremely pronounced in the cores. The graphs show a quick, vast change including the end of the Wisconsin Ice Age. (See: Evidence of Nuclear Activity in Paleoindian Times) There is a great Oxygen 18 isotope variation. Peaks of Na and very pronounced spikes in Ca, SO (sub 4) and H.
To ascribe all of these things to a "uniformitarian" idea that it just got cold and then got warm and got cold and warm... with such an evident cycle is sort of absurd. To ascribe it to a "galactic core explosion" is equally absurd. To ascribe it to "Galactic Alignment" is not worth consideration. I think that, based on the observations of the ancients that what we are looking for is a recurring shower of comets that cycles through the solar system regularly, on a 3,600 year orbit. What is more, it seems that this body of comets, clustered together resembles a Fiery serpent with a mouthful of devouring teeth in the blackness of space. For this reason, it was given the name spdt, spdw, and spd-ibhw (sharp toothed), in the Pyramid Texts. It undoubtedly is a terrifying spectacle! Of course, an important question is: what is the "initiator" of these showers, and did they begin in some interaction with an outside agent?" According to scientific studies about the possibilities of our Sun having a companion, periodic comets were "bumped" into the solar system by a dark star, a "little brother" or "little sister" of our own Sun, which has a long, elliptical orbit measured, most likely, in millions of years. If it is a companion star, present day science pretty clearly demonstrates that it must have a very long period, otherwise, we would notice it quite plainly in orbital perturbations of a certain type. In actual fact, the computer model that best fits the various dynamics is that of a 27 million year orbit. And this, of course, leads us to a considerable difficulty: the period of return of the Dark Star, as opposed to the period of disasters. Obviously, a body with a 27 million year orbit isn't likely to be remembered. However, an ancient advanced science may have certainly figured it out and it was remembered and passed down in fantastic myths and legends. Two groups have recently suggested that the Sun may have a low-mass stellar or black dwarf companion, nemesis, with an orbital period of 26 million years )Davis, Hut, and Muller, 1984) Whitmire and Jackson, 1984). They note that the perihelion passage of Nemesis throught the inner comet cloud postulated by Hills (1981) would cause an intense comet shower to enter the inner planetary system. Some comets hit the Earth, causing severe environmental stress. They propose that these induced comet showers are responsible for the periodic extinctions suggested by the data of Raup and Sepkoski (1984). The work by these experts suggests that the observations of other binary systems demonstrate the model for the projected separation they have given. Such paired stars are "physically connected systems," and that these brown dwarfs are "burning," though non-nuclear. 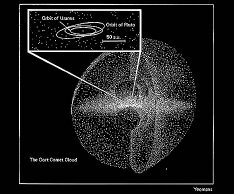 The minimum mass needed to perturb the inner Oort cloud to produce such showers is, according to Hills, 0.01 percent of the Mass of the Sun. What Hills is clearly saying is this: If it is out there, it never enters the Inner Solar system. Thus, we understand that it is not this Twin sun that makes its "appearance" at each period of catastrophe. Nevertheless, the analyses of the periodic comets suggests that it does, at very long periods, again and again, crash through the Oort cloud like a bowling ball through rows of pins, sending a new collection of them spinning into a periodical orbit, and because of the laws of celestial mechanics, they establish an orbit of 3,600 years. This idea has some support from SCIENTIFIC STUDIES, which the theory of the Planet Nibiru as a visitor to the inner solar system does NOT. A group of summer students making a long-shot astronomical gamble with the National Science Foundation's (NSF) Very Large Array (VLA) have found the first radio emission ever detected from a brown dwarf, an enigmatic object that is neither a star nor a planet, but something in between. Their surprising discovery is forcing experts to re-think their theories about how brown dwarfs work. "Many astronomers are surprised at this discovery, because they didn't expect such strong radio emission from this object," said Shri Kulkarni, a Caltech professor who was on the team that first discovered a brown dwarf in 1995, and advisor to one of the students. "What is so cool is that this is research that probably nobody else would have tried to do because of its low chance of success. That made it ideal for summer students -- we had almost nothing to lose," said Kate Becker, a student at Oberlin College in Ohio. "The radio emission these students discovered coming from this brown dwarf is 10,000 times stronger than anyone expected," said Dale Frail, an astronomer at the National Radio Astronomy Observatory (NRAO) in Socorro, NM. "This student project is going to open up a whole new area of research for the VLA," Frail added. Brown dwarfs are too big to be planets but too small to be true stars, as they have too little mass to trigger hydrogen fusion reactions at their cores, the source of the energy output in larger stars. With roughly 15 to 80 times the mass of Jupiter, the largest planet in our Solar System, brown dwarfs had long been thought to exist. Actually finding them, however, proved difficult. After decades of searching, astronomers found the first brown dwarf in 1995, and a few dozen now are known. Imagine, students discovered something that, according to the standard theories, had no right to exist. Note that the emission is 10,000 times stronger than "expected." Not 10 times, not 100 times, not even 1000 times! It is 10,000 times stronger! Ark: In 1985 Los Alamos scientist J.G. Hills published a paper  analyzing possible consequences of a passage of a hypothetical stellar companion, ‘Nemesis’. He estimated the probability for its orbit to be perturbed by a passing star to be 15%. Judging by the lack of evident damage to the planetary orbits (all orbits being nearly circular, with some irregularities for Neptune and Pluto), Hills concluded that that no black dwarf more massive than 0.02 of the mass of the Sun has entered the planetary system from interstellar space. That does not preclude the possibility that Nemesis can cyclically send cometary showers towards the internal solar system. Moreover, his conclusions are based on the assumption that there are no corrections to the standard laws of gravitation, which assumption may change in the future, when more data become available from the deep space probes, and when we learn more about the role of electric and magnetic interactions of cosmic bodies and of space plasma. LBL (Lawrence Berkeley National Laboratory) physicist Richard Muller devised the Nemesis theory  to account for regularity of the mass extinctions discovered by Raup and Sepkowski  According to this theory a companion star, called also cosmic terrorist Nemesis, orbiting the Sun, perturbs the Oort comet cloud every 26 millions years causing comet showers in the solar system. Muller believes Nemesis is most likely a red dwarf star, magnitude between 7 and 12, that should be visible with binoculars once localized. 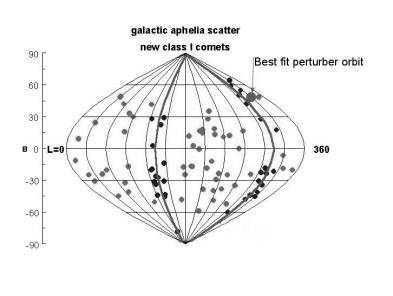 Figure 11 Graph by Matese showing cometary scatter patterns which may suggest the orbit of the “Perturber.” By permission. When we look at the mythology of the "Winged Disc" that occurs in both Mesopotamia and Ancient Egypt, we begin to realize that this symbol does not refer to a "Tenth Planet, " but to the presence in our own solar system of the Sun's dark sister, a failed star classified as a "brown dwarf." It also seems to be the one hypothesis that encompasses all the "sub-hypotheses" of the many researchers who have attempted to deal with different aspects of the problems of the past and future of the earth. Sitchin proposed that a "10th Planet" caroms through the inner solar system. Scientific evidence does not support a body the size he suggests, entering into the inner solar system. However, science can support a cluster of comets spread out in space that returns at 3,600 year intervals. Sitchin suggests that his 10th planet is inhabited by the Annunaki/Nefilim. He claims that they are our creators and masters. His ideas are tremendously out of synch with the strong circumstantial evidence about the alien presence on this planet. Sitchin's ideas are also flawed for the other reasons we have already mentioned, though he has certainly produced inspired work in his interpretations of the Sumerian texts as being related to "alien interactions" and the periodic return of something! Other theorists suggest that the Dark Companion of the Sun has its own habitable planetary system, home to the mythical 'gods' of the ancient world. This theory, that a brown dwarf with its own planetary system, is able to pass through the Oort cloud and the Kuiper belt, keeping its own mini-solar system intact, is obviously extremely problematical. In the same way that Sitchin simply passes right over the problems of Nibiru seeding life on earth, forgetting that evolutionary processes that are being postulated must apply to both bodies, the creator of the "Dark Star: Have Planets; Will Travel" theory also does not consider the fundamental problem of such an idea. The two great themes of myth are the yearning for the golden age and a terror of a world destroying catastrophe. And the two ideas are inextricably linked to each other. In virtually all of the stories about the Fall from Eden and the Flood of Noah, the great celestial bodies in the heavens were said to have been out of control. Kochab is an obscure Arabic name that might simply mean "star." It is just barely the second brightest, and appropriately the Beta, star in Ursa Minor, and represents the top front bowl star of the Little Dipper. Only 15 degrees from the north celestial pole, middle northerners can see it every night as it follows its small circular path. Together with the other bowl star (Pherkad, the Gamma star), it makes a small asterism called the "Guardians of the Pole." In myth, it seems that the function of these stars is to "protect" the pole star. (This star has run out of hydrogen fuel and is an evolving orange giant star running on helium, giving off infrared light). The importance of this star is that it was referred to as the `Mill Peg' and with the other stars surrounding the North Pole, was called the "hole of the mill peg because they represent as it were, a hole (the axle ring) in which the mill axle turns since the axle of the equator (the polar axis) is to be found in this region, fairly close to the star Al-jadi (Polaris). There is a myth associated with this that the Mill Peg which held the earth upright had broken loose and the polar axis had tilted. Now the serpent connected to the Garden of Eden story and Draconis was the old, evil serpent. The constellation Draco and Hercules and Ophiuchus and Serpens are associated in ancient mythology, illustrating the struggle between mankind and serpentkind. In ancient times, Draconis was on top of the World-tree and laid in the same plane as the equator, so the days and nights were equal year round - a true `paradise'. When the axis of the earth tilted, the `Serpent was cast down'. Now it is time to locate the origin of the image of the Mill, and further, what its alleged breakup and the coming into being of Whirlpool can possibly mean. The starting place is in Greece. Cleomedes (c. AD 150), speaking of the northern latitudes, states (1.7): “The heavens there turn around in the way a millstone does.” Al-Farghani in the East takes up the same idea, and his colleagues will supply the details. They call the star Kochab, Beta Ursae Minoris, “mill peg,” and the stars of the Little Bear, surrounding the North Pole, and Fas al-rahha (the hole of the mill peg) “because they represent, as it were, a hole (the axle ring) in which the mill axle turns, since the axle of the equator (the polar axis) is to be found in this region, fairly close to the star Al-jadi…" These are the words of the Arab Cosmographer al-Kazvini. Ideler comments: “Koth, the common name of the Pole, means really the axle of the movable upper millstone which goes through the lower fixed on, what is called the ‘mill-iron." There is a remark by Trimalchio in Petronius (Satyricon 39): “Thus the orb of heaven turns around like a millstone, and ever does something bad.” It was not a foreign idea to the ancients that the mills of the gods grind slowly, and that the result is usually pain. The nine grim goddesses who “once ground Amlodhi’s meal,” working now that “host-cruel skerry quern” beyond the edge of the world, are in Mundlfoeri, literally “the mover of the handle.” The word mundil …”is never used in the old Norse literature about any other object than the sweep or handle with which the movable millstone is turned. Here we have a clue that refers directly to something that "turns the mill." The "nine grim goddesses," which we may identify with the Egyptian Ennead, are located in the "handle." And here we see the idea of a binary star system moving in tandem orbit with one another. The identity of the Mill, in its many versions, with heaven is thus universally understood and accepted. But hitherto nobody seems to have wondered about the second part of the story, which also occurs in the many versions. How and why does it always happen that this Mill, the peg of which is Polaris, had to be wrecked or unhinged? Once the archaic mind had grasped the forever enduring rotation, what caused it to think that the axle jumps out of the hole? What memory of catastrophic events has created this story of destruction? Why should Vainamoinen … state explicitly that another Mill has to be constructed? Why had Dhruva to be appointed to play Pole star – and for a given cycle? For the story refers in no way to the creation of the world. The simple answer lies in the facts of the case. The Pole star does get out of place, and every few thousand years another star has to be chosen which best approximates that position. It is well known that the Great Pyramid, so carefully sighted, is not oriented at our Pole Star, but at alpha Draconis, which occupied the position at the pole 5,000 years ago. …It is the more difficult for moderns to imagine that in those far-off ages men could keep track of such imperceptible shifting, as many of them are not aware of the mere facts. This remark about the Pyramid being oriented to Draconis is an ignorant remark. The fact is, the orientation of the pyramid to the pole remains constant. It is only the pole stars that change. Most of these myths, however, come under a misleading name. They have been understood to deal with the end of the world. …What actually comes to an end is a world, in the sense of a world-age. Coherence will be reestablished in this welter of traditions if it is realized that what is referred to is the grandest of heavenly phenomena, the Precession of the Equinoxes. Now, did you notice what these two authors have done here? Aside from their abysmally ignorant remark about the orientation of the pyramids to Draconis, they have resorted to Uniformitarianism to explain the great mystery of this worldwide myth of the “unhinging” of the Pole star. They, and many, many others, have followed this path, believing that all the clues from ancient monuments and myths have to do simply with measuring time, “World Ages,” in more or less “cultural” and historical terms. The World Age of the Hebrews was the age of the Ram, symbolized by Abraham taking his son to sacrifice him, and a Ram appeared in the thicket, and such other allusions. The age of Pisces, the age of Christ, is symbolized by the fish, and numerous allusions are dredged up to support that one. Now, we are supposed to be entering (or have already done so, depending on your source), the Age of Aquarius. I should point out right here that if the Precession of the Zodiac was such a great way to measure time and world ages, there wouldn’t be so many opinions about when one began and another ended. As a measure of time that is so “vastly elegant,” it ought to at least work, right? Well, it doesn’t. What is more, the zodiac has been created and altered within recorded history, having at various times ten signs, eleven, twelve and thirteen. So, what's the point? From this perspective, there isn't one except for an attempt to deny the possibility that the ancients meant exactly what they said even if they did tell the stories as allegories. But still, using this Precession as a giant clock, with some fantastic perambulations through archaic lore, a dozen or more authors have produced as many different versions of what a “world age” is, and “when” they begin and end, and how. They then try to link these ages to all sorts of weird theories from the opening of "stargates" to galactic core explosions to "monuments to the end of time." The answer is a lot more simple than that. I think that those things that point us to the idea that the pole comes “unhinged” do, indeed point to the Precession. But the important thing about this Precession is that it points us to the fact that the Earth WOBBLES. And I think that the thing the ancients are trying most desperately to point out to us in these stories is that the Earth wobbles for a REASON, and we ought to notice this wobble and ask some questions about the "nine grim goddesses" who "turn the handle" and where and what that "handle" might be that increases friction to the point that fire is produced! In this sense, the ancients might have supposed, and quite rightly, that if we ever noticed this fact, if we were pointed in this direction, if we were plainly told that there is a handle that turns the axis, that this handle gets hot, that the axis of the planet comes unhinged, that it started out spinning upright and then gradually wobbled out of place and finally FALLS OVER INTO THE SEA, that we would be clever enough to get it. The clue they are pointing out to us is that there is something OUT THERE that is the HANDLE and we ought to be able to figure out, by applying principles of atomic physics to celestial mechanics, exactly what it is and what it does. The repeated references to the “dying and rebirth of the Sun,” in some sort of cosmic hierogamy and the Sun giving birth to a daughter, or having a Celestial Twin ought to be pretty plain clues to anybody who is paying attention to these things. Zecharia Sitchin, the world renowned scholar & archaeologist now finally agrees, quote: "I prophecize the return of this planet called Nibiru AT THIS TIME!" Trusting the Pentagon/gov't to guard itself & relay needed information to protect you is clearly illogical. In July the red planet "2001 KX76" was disclosed. This was the original cover-label for Planet X, Nibiru, Wormwood, or THE MOST REVERED HEAVENLY BODY IN ALL ANTIQUITY. After 3600 years on its regular orbit it will pass again in SPRING 2003. It's RECORDED IN ANCIENT TEXTS & the SCIENCE OF ARCHEOLOGY shows its effect on Earth with each passage. Yes, some conspiracies are without merit, ignoring history and science is another matter. By August 2001 the disinformation had changed to the LARGEST ASTERIOD EVER and it's now shown as blue. It's the same label on a different object. When the attention was drawn to the area by announcing the "Largest Asteriod" was there, they made sure the color of the new "2001 KX76" was blue. 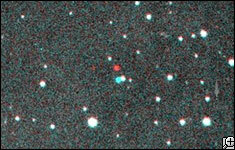 All speculation about a large DULL RED brown dwarf being there was to be avoided. This is one of their tactics for hiding Planet X. First giving it a label, then using that same label for another object to misdirect attention. X is not a red KBO. The original color was not red for photographic reasons. Too many stories for the color change is just the first of many obvious clues of a cover up. They will continue to identify objects ahead and around X to misdirect attention. The normal helpful & professional Nasa employees are being evasive & condescending when asked about it. X has INTENTIONALLY BEEN MADE TO SOUND RIDICULOUS and confusing for several reasons. One of which is to avoid causing panic among the world's population. Many websites and articles continue to be written about Planet X that spread lies. They say it only MAY exist and comes around only once every few million years IF it does. This disinformation is widespread. X orbits between our sun and its dark twin. A diagram from the 1987 NEW SCIENCE & INVENTION ENCYCLOPEDIA shows our dead twin sun & the 10th planet. X's MASS, MAGNETISM & DENSITY is such that it DISRUPTS the surface of EVERY PLANET IT PASSES. In fact, history shows approximately 7 YEARS PRIOR to its passage its far reaching eletromagnetic/gravitational influence changes Earths core flows TRIGGERING WEATHER, VOLCANIC & SEISMIC ACTIVITY. Since early 1996 traditional WEATHER has CHANGED DRAMATICALLY, breaking all time records regularly. The up-tick of QUAKES, VOLCANIC INCIDENTS & changes in ELECTROMAGNETICS are being kept out of the media as much as possible. Weather alone can falsely be blamed on global warming & sun cycles but not earths rumblings at the same time. Research the advent of PLANET X and the cataclysms it will trigger by passing EARTH. Being prepared and FOREWARNED gives one an EXCELLENT CHANCE to SURVIVE. "BLINDSIDED, PLANET X Passes in 2003, EARTHCHANGES!" Even the majority of the earthchange intuitives prophecies are tied into or name Planet X. ALL OTHER NEWS PALES IN COMPARISON TO THIS IMPENDING MEGA WORLD WIDE EVENT OF BIBLICAL PROPORTIONS. July 3 — The discovery of a large reddish chunk of something orbiting in Pluto's neighborhood has re-ignited the idea that there may be more than nine planets in the solar system.[...] What the discoverers are calling 2001 KX76 might be one of the largest "Kuiper Belt Objects" or KBO's, found in the what is essentially a second asteroid belt beyond the orbit of Neptune. Initial reports give 2001 KX76 a diameter of 900 to 1200 kilometers — roughly the size of Pluto's moon, Charon. Pluto itself, it should be noted, is smaller than our own moon. "There are certainly lots of (KBOs) in distant parts of their orbits now and we can't detect them," said Millis. The possibility that 2001 KX76 has big brothers and sisters again raises the thorny question of what can be called a planet and what cannot. [...] Historically, Pluto was designated a planet when it was discovered in the 1930s because it was thought to be much larger than it is, Marsden said. [...] If 2001 KX76 is any indication of larger KBOs out there, it might also lead to the demotion of Pluto from puniest planet to king of KBOs, said Marsden. Millis prefers a third alternative: "There may exist a new class of planets." 23 August 2001: Ceres, the first asteroid (minor planet) to be discovered in the Solar System, has held the record as the largest known object of its kind for two centuries. 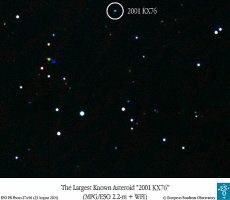 However, recent observations at the European Southern Observatory with the world's first operational virtual telescope 'Astrovirtel' have determined that the newly discovered distant asteroid "2001 KX76" is significantly larger, with a diameter of 1200 km, possibly even 1400 km. "Caption: ESO PR Photo 27a/01 shows a reproduction of a colour composite image, based on three exposures with the Wide Field Imager (WFI) at the MPG/ESO 2.2-m telescope at the La Silla Observatory. By combining data from the world's first operational "virtual telescope", Astrovirtel, with that from a conventional telescope at the European Southern Observatory (ESO) at La Silla (Chile), European astronomers have determined the size of the newly found, remote asteroid, 2001 KX76. Their measurements indicate that this icy rock has a diameter of at least 1200 km and is therefore larger than any other known asteroid in the Solar System. The previous record-holder, the asteroid Ceres, was also the first object of its type to be discovered - by the Italian astronomer Giuseppe Piazzi on January 1, 1801. Its diameter is about 950 km, relegating it to second place after holding the asteroid size record for two hundred years." Now, let's just get clear about this. The very first article was about an object that no one was sure whether they ought to call it a planet or not. It was larger than what we call asteroids, but smaller than Pluto. So, it was, at first, called a planet. But please note, the size was given in the first article, and it was then reiterated, only given a likelihood of being slightly larger than the original estimate in the second article. So, the entire discussion was about whether to call this object a planet or an asteroid. And, apparently, it was decided that "asteroid" was a better choice until the decision about what size constituted being a planet was decided once and for all. And how BIG is this putative "Planet X?" This gigantic and terrifying object that Zecharia Sitchin predicted and which is now being claimed to be hidden from us in this tricky shell-game by NASA? The first scientific results from Astrovirtel have allowed a substantial improvement of the accuracy of the computed orbit for 2001 KX76. It is now possible to confirm that this object is just outside that of the most remote known major planet Pluto. Further analysis carried out by the team seems to indicate that the orbit of 2001 KX76 is very similar to that of Pluto. Asteroid 2001 KX76 is even larger than Pluto's moon Charon (diameter 1150 km), adding fuel to the discussions concerning Pluto's status as a "major" or "minor" planet. The new data show that 2001 KX76 is about half the size of Pluto (diameter about 2300 km) and this increases the likelihood that there are other bodies still to be discovered in the outer Solar System that are similar in size to Pluto. The first observations of 2001 KX76 were quite sparse, so the initial estimates of the size of the new asteroid were very uncertain. However, it did look large, possibly about the same size as the largest known asteroid, Ceres, the diameter of which had earlier been measured at about 950 km. In order to measure the size of any asteroid, it is necessary first to determine its orbit around the Sun, which gives its present distance from the Earth. The next step is to estimate its "albedo", i.e. the percentage of incident sunlight reflected from its surface. From these numbers and the measured, apparent brightness of the asteroid (as seen from the Earth), its diameter can finally be derived. To determine the orbit of 2001 KX76, the group used "Astrovirtel" to apply automatic search software to scan through "old" photographic plates obtained with various astronomical telescopes, as well as recent CCD observations made with the ESO Wide Field Imager (WFI) at the MPG/ESO 2.2 m telescope on La Silla (Chile). The search was successful: the astronomers were able to find several photographic plates on which faint images of 2001 KX76 could be identified - some of these plates had been obtained as early as 1982. The exact sky positions were measured and with accurate positional data now available over a time span of no less than 18 years, the team was able to compute the first, high-precision orbit of 2001 KX76. This also allowed to determine that the current distance from the Earth which turned out to be about 6.5 billion km, corresponding to 43 times the distance of the Earth from the Sun, or nearly one-and-a-half times farther from the Sun than Neptune. Now, what are we to make of all of this? It's fairly evident that I am not saying that something is not going to happen. After laying out the evidence that there is, indeed, a 3600 year cycle, and that the last "hit" was right around 3600 years ago, no one can accuse me of not being as "catastrophic" as the next person. In fact, I think that what we are suggesting here, including our findings that something is definitely being hidden from us, is singularly catastrophic. In fact, it is damn scary. However, we believe that having accurate information about these matters is not just important, but that it is CRUCIAL. Does the reader have any idea of how long it takes an object in the neighborhood of Pluto to get here? Pluto is 6,000,000,000 km from Earth. If you travel at 100 km/hr, you could get to Pluto in 6849.3years Moving at 1,000 MPH, it will tak 684.9 years to get to Pluto, or vice versa. So please, take it to the bank that the object sighted in the neighborhood of Pluto is NOT Nibiru/Planet X and it is NOT going to arrive in 2003. Unfortunately, I cannot guarantee that there will not be an asteroid strike in 2003, or anytime between now and then. THAT could happen any day. If there is a brown dwarf perturber that slams through the Oort cloud, and if we do have a cluster of comets that travels on a 3600 year orbit, then there is NO WAY to have ANY warning whatsoever without the willingness of the government and the scientists who have control of the instruments of observation to share their data with us. And I can promise you that if a panic ensues from false alarms such as this nonsense about Nibiru, there will be no possibility of any sharing of data, and if it is gonna happen, you won't know. The Cassiopaeans have given us the clues. We have followed and are continuing to follow them and make discoveries that are grounded in scientific fact. We have discovered that there is, indeed, a Control System; that the influence of science has been to institute a form of Thought Control. But it most certainly does not operate the way the Rumormongers and purveyors of hysterical, half-baked theories would have us believe. What is more, there is much, much more to this matter at the present time than meets the eye. There are many other clues, and we are making discoveries regarding these clues almost daily. We are also coming under increasing financial pressure that is obviously an attempt to prevent further discoveries, as well as deliberate attacks from various "cells" of the Thought Police intended to dissuade us from pursuing our present research. What do I think? I think that, based on what the Cassiopaeans have said, supported by our research to this point, it is very likely that we are already experiencing some of the comets from the cluster that has been cycling through the solar system on that 3600 year orbit. In fact, we - or our Moon - may get hit by a couple of small ones in the next year or two. But I think that, for the most part, this former group has lost its potency. It is scattered and dissipated. Indeed, it seems likely that it is time for the birth of a new cluster from "between the thighs of the Ennead." I think that we will witness some amazing astronomical phenomena in the next few years. "Signs in the Sun and Moon." I think that the powerful activity of the Sun during this sunspot maximum has been because its companion is drawing close. It is not yet close enough to be seen, but that will probably change. We may see it in the next year or two. There will be more solar activity. The companion star will be seen to "interact" with its primary similar to observations of other binary star interactions. A "hieros gamos" of cosmic proportions will take place. Earthquakes will shake the earth. Volcanoes will erupt. Sitchin will go on a veritable world tour of lectures declaring that this is the appearance of Nibiru and that he was "the first" to predict it. He will be lionized, courted, interviewed, and trotted out on all the television shows. Oprah will kiss his cheek and Art Bell will give him a regular spot. But the important thing to remember is this: It will not be a planet Nibiru. There is no "Planet Nibiru." But there IS a sun's companion, Nemesis. And, even if this companion star is seen, it will never enter the inner solar system. That is not the way these types of bodies interact with each other. The closest that Nemesis will come is probably the orbit of Pluto. It will then "go away." Everyone will settle down and think that nothing is going to happen. Sitchin will be disgraced because his predicted giant planet won't do what he says it will do. Oprah will no longer take his calls, and Art Bell will not answer his faxes. But that will not be the end of the matter... Because the important thing to remember about the appearance of a Dark Star at the outer reaches of our solar system is that, in order to get close enough to be seen, it has to pass through the Oort cloud and the Kuiper belt... like a bowling ball through a row of pins. What is more, the macrocosmic quantum changes that could result from an interaction between a binary star system are too poorly known, and may contribute to an entirely different cometary intinerary. Cometary bodies that are slammed into the Solar System by a gravitationally heavy object may proceed rather more quickly than one would suppose. And so, in addition to whatever is left over of a cyclical cometary swarm from the previous interaction with our Sun's companion, will be augmented by a whole new grouping. Is this attack really justified? Is talk about jumping planets evidence of ignorance, as the authors of Three Big Bangs seem to imply? Up to the present time the computer simulations that have been done  have not even attempted to take into account a possible cosmic intruder - the brown dwarf Sun’s companion whose existence and properties have been researched by R. Muller and J. Matese. They also did not try to take into account a possible fractal structure of space-time, which was the subject of a series of papers and of a monograph by French astrophysicist Laurent Nottale. I have discussed Nottale’s rules of quantization of planetary systems in my notes in the present work. Here it is enough to say that fractal and multidimensional structure of space-time, along the ideas put forward by many physicists, astronomers and astrophysicists, whose works are quoted in this book, make cosmic jumps plausible. My own research added one more factor here: as discussed in this work, it is one of the conclusions of EEQT that, as a rule, couplings of quantum systems to classical ones induce chaotic behavior and fractal-like patterns of quantum jumps. That may be one of the reasons why space-time is fractal-like both in micro- and in macro-scale. The event generating algorithm that is at the foundation of EEQT can be easily modified, using cosmic scale coupling constants, to describe such jumps in terms of a piecewise deterministic Markov process, when prolonged periods of continuous evolution are interspersed by jumps of a random character. The main feature of EEQT is that it provides an algorithm for describing the history of an individual system, where jumps really take place. Therefore it provides appropriate tools for dealing not only with micro-particles but also with cosmic bodies, as discussed in this present work. It may also put tools into our hands that will help us to intervene in the “events” of Cosmic Catastrophe. The primary message of Noah is that one such continuous period may be coming to an end soon, and that the target quantum state after the jump is not fully determined. Our actions, or our lack of action now, shape the probability distribution of our future “after the Flood” environment. Talk about your lame interpretation! Next they will be saying that the ancients were howling savages who smeared bear grease in their hair! We notice that the authors don't jump on this pregnant allusion! And here I beg to differ. It is far more difficult for me to comprehend how these two authors can be talking about the ancients grasping this concept, and then to wonder why anyone with the brains to do so would even care! That is, assuming it is just a "concept." Snorri Sturlson, author of the Prose Edda. This shows clearly to what extent the greenhouse effect has been overestimated in comparison with the solar contribution to climate change, which turns out to be the most important factor. Note:The 'Virtual Observatory' concept, for which "Astrovirtel" is a prototype, is the start of a new era in astronomy. A larger study project called the 'Astrophysical Virtual Observatory' is now about to start within the Fifth EC Framework programme as a collaboration between ESO, ESA (ST-ECF), the University of Edinburgh (UK), CDS (Strasbourg, France), CNRS (Paris, France) and the University of Manchester (UK). Observatory (ESO). Credit to "ESA, ESO, Astrovirtel and Gerhard Hahn (German Aerospace Center, DLR)". Members of the group of scientists involved in these observations are: Gerhard Hahn (German Aerospace Center, DLR, Berlin; http://earn.dlr.de/daneops/), Claes-Ingvar Lagerkvist (Uppsala University, Sweden; http://www.astro.uu.se/planet/asteroid/), Karri Muinonen, Jukka Piironen and Jenni Virtanen (University of Helsinki, Finland; http://www.astro.helsinki.fi/~spa/), Andreas Doppler and Arno Gnaedig (Archenhold Sternwarte, Berlin, Germany) and Francesco Pierfederici (ST-ECF/ESO).